Janine is an author, a researcher, publisher, and professional bookmaker. She has been a full-time caregiver since 1984 when her adoptive father survived a traumatic brain injury from a 100-foot hang-gliding fall. Janine has over 20 years of writing experience and more than ten books (a few are Amazon best sellers in the subcategories of women's history, teen & young adult issues, and adoption) and seven feature-length screenplays to her name. Janine specializes in memoir writing, but can also make books for families, charities, businesses, or institutions. Want to start or finish the memoir of your dreams? Janine Vance has developed a methodology for writing books that will help you to complete your memoir in record speed. In a personalized writing sabbatical, she asks carefully crafted questions which will build your plot, create suspense and meaning with ease, and organize each chapter based on your life events - all the content you need for a memoir. Her questions will quickly help you find the right answers. No more floundering. Need a specialty book for a beloved relative, a business, or for your own proud accomplishment? When it comes to memoir writing, Janine is your secret weapon. She knows the right questions to ask to get you to the finish line so you can see your story in print once and for all. Finish your memoir today and reap the rewards! Janine shows you how. You keep the credit & the copyright. Get Janine's memoir and see a sample of her work. The Search for Mother Missing by Janine Vance tells the story of international trans-racial adoptees Janine and Jenette Vance who grew up, despite the prejudice, believing they were fully American. It’s only at the age of 25 that they discover they have got green cards, not actual US citizenship, despite having lived in the country practically their entire lives. It is this statelessness that brings the issues of their origins to the fore. Previously the twins had avoided the issue, believing it would seem ungrateful or disrespectful to their adoptive parents. They had been told they were found in a box on a street corner in Seoul and nothing more. Now in their early thirties, they journey into the motherland for an international conference of Korean-born adoptees where they hope to learn more about their culture, their background and find their family. It’s here on their trip that they experience the shady dealings of the international adoption agencies and other eye-opening and life-altering experiences. The Search for Mother Missing has a lot of strengths. Janine Vance went for something more well-rounded. When issues of great pain and suffering are discussed they never come across as overwhelming, as you would expect when issues as serious as these are at the center of a book. This was a brilliant choice; to be informative without being exhausting. It helps a lot that Janine’s writing and her entire organization of this book is so welcoming, easy to follow and heart-warming. She draws you in quickly and you identify with her. It is this sense of effortlessness and the hope of the story that really makes this book gripping. The Search for Mother Missing answers some question in a very satisfactory, insightful manner that will make you see the world of international adoption differently. Those questions are: what’s it like to be a trans-racial international adoptee? Do the benefits of international adoption outweigh the costs, and vice versa? What rights should the child, biological parents and adoptive parents have? What sort of protections are necessary? When is adoption appropriate? These aren’t easy questions and Janine Vance doesn’t give easy answers either, but they are honest and thoughtful answers nonetheless. I highly recommended this book, if not for its candor, for its uplifting story. The Search for Mother Missing: A Peek Inside International Adoption is a nonfiction adventure memoir written by Janine Vance. In 1972, Vance and her twin sister were adopted as infants by an American couple. They had been born in Seoul, South Korea, but little was known of the circumstances leading to their being placed for adoption or the identity of their birth parents. The twins grew up in Washington State knowing little about Korea or the culture into which they were born. When they were in their early thirties, they began to wonder more about the adoptee phenomenon and realized they were a part of a group of young people who had been wrested from their own environment. The Adoptee Gathering in Seoul seemed to offer a chance of answering all the questions Janine had been increasingly concerned with. She fantasized that her birth mom would be one of the parents she knew would be attending the Gathering. Their adoptive dad was worried about his girls going to Korea. He had come to rely upon them increasingly since his accident. Would they return? Would things be forever different? Still, he encouraged them to sign up for the Gathering, and soon Janine and Jenette were on the plane taking them to Korea. The Search for Mother Missing is an eloquent and well-written account of her experiences in Korea during The Adoptee Gathering. I shared her disappointment as she encountered the dissembling and obstructive tactics of the adoption agencies who seemed both defensive and unconcerned about the ramifications of their actions. At the same time, I loved seeing how Janine and her sister shared real bonding moments with the other adoptees as they attended conferences and visited historical and cultural places in their homeland. And while I could still sense Janine’s anger and disappointment, she also shares the healing and insights she gained from the experience. The Search for Mother Missing: A Peek Inside International Adoption is an important read for anyone who’s ever wondered about the trend of international adoptions and the impact felt by both birth and adoptive parents and the targeted children. It’s highly recommended. Vance’s narrative contains passion and in honesty. Through the author’s eyes, we’re able to get a glimpse of another world that is foreign to most of us, and to experience the vulnerability and uncertainty faced by Janine, her sister, and the many other adoptees who gathered in Seoul in search of a vital piece of their lives. Vance doesn’t provide any pat answers or platitudes which would have rung false under the circumstances. She speaks of her adoptive parents with love, respect and gratitude and while others might have returned home bitter after learning the deceptive practices of the Korean adoption agencies, Vance has done the opposite. She’s become an advocate for all adopted children and her voice rings with heartfelt integrity. The Search for Mother Missing: A Peek Inside International Adoption is a compelling book that is a must-read for all adoptees or for those who simply seek that missing piece to their lives. 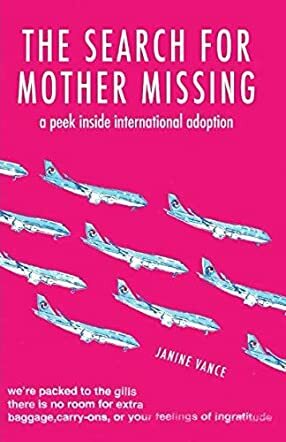 The Search for Mother Missing: A Peek Inside International Adoption by Janine Vance is a non-fiction memoir written by Janine on international adoption and also her own personal story. Janine and her twin sister were adopted from Korea at a young age by an American couple and were almost oblivious of their birth country or birth parents until in their thirties. This book is about their short trip to Korea as adults in search of their biological parents and the journey it takes them on. The book has a short introduction in the beginning by their father who adopted them while their adopted mother is deceased. The story then dives into how their trip to Korea came about, a little bit about their early background and upbringing in a white American family, their citizenship status in America as a result of international adoption of those times, and an evolving narrative and commentary on the inherent flaws of an adoption system that takes false pride in “protecting information” that would lead to adults and their biological parents reconnecting. The Search for Mother Missing is a strong, powerful book on the present system of adoption. I agreed with Janine on this question of useless, enforced “anonymity” between biological parents and children or any blood relatives for that matter. While not all adopted people would want to learn their roots, it is their right to know them if they wish. Similarly, as much as the biological parents voluntarily gave up the child for adoption, people and circumstances can change and leaving that door open for future contact is the only humane thing to do. Janine’s fresh voice and writing style throw a spotlight on this issue. I hope more people realize the state of the present system and encourage and support “open adoption” where contact between birth relatives is supported if all parties wish it. This is a great book and I am looking forward to reading more from this author. The Search for Mother Missing: A Peek inside International Adoption by Janine Vance is a gripping memoir of adoption and two sisters’ search for their roots. Janine and Jenette were only six months old when they were adopted from Seoul, South Korea, by an all-American couple living in Washington. That was in 1972, and the twins grew up believing that they belonged, facing the normal challenges of life and helping their adoptive parents the best they could. They never thought about their birth country for the first thirty-two years, an issue that was never mentioned, even in passing, by their adoptive parents. But the twins had shocking revelations waiting for them. In fact, they were not fully-fledged American citizens and had never been naturalized. The itch to discover their roots became strong. A journey that started with a memorable encounter at the Korean Post led the twins to travel to their home country in search of their birth parents. Would the chance to travel to Korea be that opportunity to reconnect with their biological family? The revelations are mind-blowing. Janine Vance explores the implications of international adoption in writing that is clear and insightful, allowing readers to understand the journey from the perspective of the adoptees while exploring issues of the rights of the adoptees and how those rights can be abused. The narrative voice is powerful and clear and the prose good. The Search for Mother Missing: A Peek inside International Adoption asks important questions related to the rights of children adopted internationally, explores the challenges they face, and the anguish of being disconnected from one’s true parents. It is poignant, insightful, and gripping, filled with humanity.